I don’t know about you, but I crawl out from under winter’s grasp wanting lighter everything. Lighter clothes, lighter clutter and decor in my home, lighter makeup and of course – lighter food. It’s towards the ends of February that I start thinking and dreaming about those Summer Salad Recipes. I have a few favorites such as spinach, strawberries,walnuts, a sprinkle of feta and a dash of a vinaigrette. But I also like to try out new ones. Some with meat or fish for a heartier meal time dish. Some without for a light lunch. You get the picture. 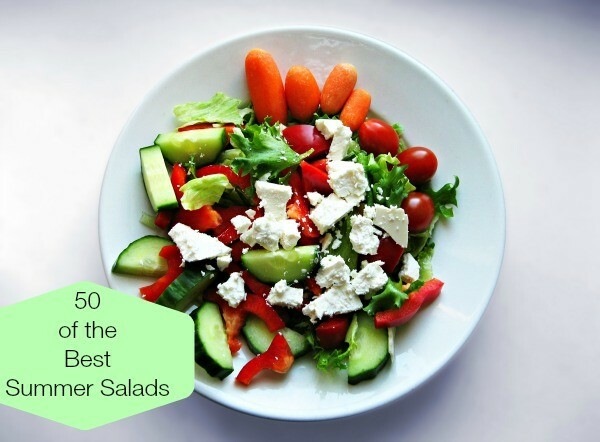 In order to inspire us all, I’ve rounded up 50 of the Best Summer Salad Recipes I could find. I would love it if you shared one or some of your favorites in the comment section. Let’s just make this a mega summer salad resource for the entire world shall we? I like to dream big. Enjoy! Great choices on salads! Thank you fore featuring Malibu Kitchen’s salad!